Features • 1) FCC & Net Neutrality, What's Next? 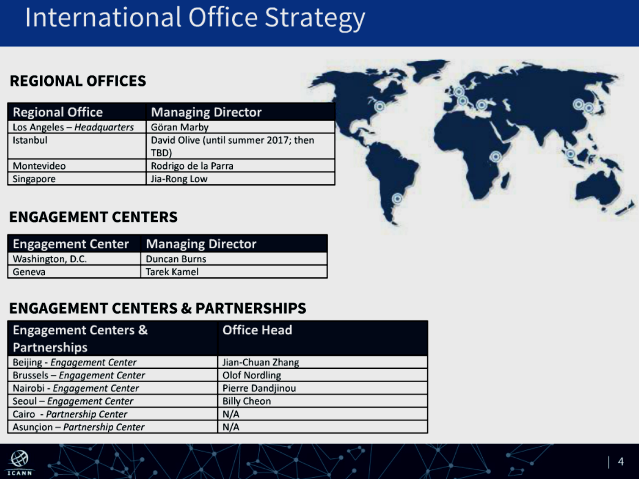 2) Names, Domains & Trademarks: UDRP Filing Triggers RDNH Federal Lawsuit, and a .COM domain name sells for $2.89 million, 3) ICYMI: Google LIVE in Cuba, 4) Earnings Season: Apple $AAPL, GoDaddy $GDDY, Facebook $FB, 5) ICANN News: ICANN's International Office Strategy, 6) Most Popular. 1) FCC & Net Neutrality, What's Next? Video above published Apr 27, 2017, by PBS News Hour: Ajit Pai, FCC chairman, has plans to do away with net neutrality rules that have been in place for the last three years. Pai argues the rules are too burdensome and that they stifle innovation and competition. William Brangham discusses the changes in oversight with Pai. Restoring Internet Freedom--Notice of Proposed Rulemaking – WC Docket No. 17-108 (pdf) April 27, 2017, and related documents. Joint Statement of FCC Commissioner Mignon Clyburn and FTC Commissioner Terrell McSweeny on Leaving Broadband Consumers and Competition Unprotected (pdf): April 27, 2017 – “Today Chairman Pai released a plan that, if implemented, will hand over control of the open internet to the powerful gatekeepers of our connections to the modern world. Despite the Chairman’s description of the proposal as a way to reduce onerous regulation, stimulate investment, and protect consumer privacy, the proposal would do otherwise. If adopted, Chairman Pai’s proposal will harm competition and innovation and will leave consumers without any real protection or oversight by either the FTC or FCC for broadband services..."
UDRP Filing Triggers RDNH Federal Lawsuit--Web Developer Sues UDRP Complainant Over Internet Domain Name: In U.S. District Court (Middle District of Florida), Plaintiff VirtualPoint Inc., the domain name registrant of fasttrak.com, sued FastTrak--copy of Plaintiff's complaint (pdf)--after FastTrak filed what plaintiff termed a “baseless and factually erroneous UDRP complaint." (See Plaintiff's complaint, supra, at ¶15.) Plaintiff seeks a declaratory judgment of non-infringement, punitive damages, and damages of not less than $100,000 for reverse domain name hijacking, as first reported in Bloomberg | BNA.com. Non-Trademark Use is a Non-Infringing Use | Harness, Dickey & Pierce, PLC | JDSupra.com: "... Because this was a non-trademark use of plaintiffs’ trademarks, the Sixth Circuit did not have to reach the question whether the fair-use defense applied. As the Supreme Court said in Prestonettes, Inc. v. Coty, 264 U.S. 359, 368 (1924), “When the mark is used in a way that does not deceive the public we see no such sanctity in the word as to prevent its being used to tell the truth.”"
Seller Travelzoo Inc., continues to do business under its domain name travelzoo.com. Sale first reported by OnlineDomain.com via George Kirikos. Google Servers Go LIVE in Cuba | cnbc.com: "Google's servers in Cuba went live on Wednesday [April 26, 2017], making the internet giant the first foreign internet company to host content within the long cut-off country." Trend Micro report (pdf) details political-influence activities of cyber espionage group Pawn Storm, a/k/a APT28, Fancy Bear, Sednit, over past 2 years. "... Pawn Storm uses mainstream media to publicize their attacks and influence public opinion ..."
Net Neutrality: Vodafone (India) wants right to manipulate Internet videos | UltraNews.com: "India does not have any specific guidelines on these matters and the telecom regulator is creating new laws via its consultation on net neutrality." DOJ Antitrust Nominee Makan Delrahim's Hearing on Hold | broadcastingcable.com: Committee chairman Charles Grassley (R-Iowa) said that a piece of paperwork was missing, which prevented Delrahim from being considered at the Wednesday hearing, and once the paperwork is filed, Delrahim will appear at "our next hearing." • This past week: Google (Alphabet), Amazon, Verisign, Twitter, and T-Mobile. 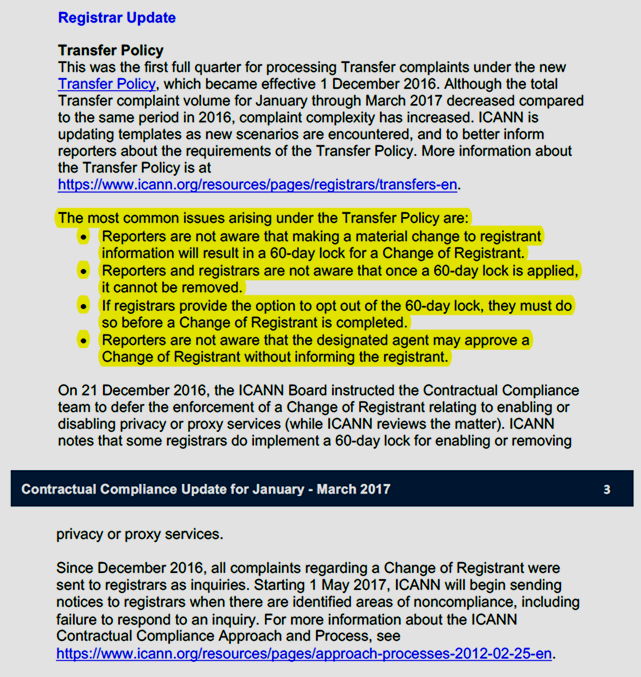 • ICANN Complaints Office | ICANN.org: "The Complaints Office handles complaints regarding the ICANN Organization that don't fall into an existing complaints mechanism." The full complaints process is targeted for launch in mid-July 2017. More info at link above. *Note: all references to Editor's Note herein are to the above. Features • 1) How To Detox From Your Smartphone, 2) Easy Come, Easy Go: Alphabet's "Other Bets" $855M Operating Loss, 3) Q1 2017 Earnings This Coming Week: $AAPL, $GDDY, $FB, 4) Drones a $100B Opportunity, 5) Game Industry’s Digital Revolution, 6) Global Accountability Index, 7) Don't use Apps? 8) ICYMI. Video above published Apr 26, 2017: Six out of 10 adults in the UK told Ofcom last year that they felt 'hooked' on their smartphones. Emma Jacobs, FT.com work and careers columnist, shares her digital detox tips. This past week: Google (Alphabet), Amazon, Verisign, Twitter, and T-Mobile. 4) Drones: Reporting for Work| goldmansachs.com: "Between now and 2020, we forecast a $100 billion market opportunity for drones—helped by growing demand from the commercial and civil government sectors." 5) Game Industry’s Digital Revolution | ArsTechnica.com: "... the game industry at large has transitioned from a business based on physical goods to one dominated by digital downloads and online purchases." 6) Global accountability index | Hong Kong Free Press | hongkongfp.com: "Chinese internet companies Baidu and Tencent have ranked poorly in a global corporate accountability index. Their performance reflects a restrictive environment which makes it difficult for them to respect freedom of expression and privacy, non-profit research initiative Ranking Digital Rights (RDR) said." See also: Ranking Digital Rights - 2017 Corporate Accountability Index | rankingdigitalrights.org. 7) Don't use Apps? (unless you absolutely have to)--FalseGuide Malware in Play Store Infects 2M Users, Forces Phones to Join Botnet | softpedia.com: "about 2 million Android users have mistakenly installed malware on their devices straight from Google Play, the company's official app store." Facebook and the Cost of Monopoly | Stratechery.com by Ben Thompson: "Facebook intended to not simply adopt one of Snapchat’s headline features but its entire vision" and Instagram is growing faster than ever and now has 700 million users | Recode.net: "It took the company just four months to add 100 million new accounts." In 30 years, the best CEO could be a robot? "In the next three decades, the world will experience far more pain than happiness ... education systems must raise children to be more creative and curious or they will be ill-prepared for the future. Robots are quicker and more rational than humans, and they don't get bogged down in emotions -- like getting angry at competitors." --Jack Ma as reported by cnn.com. Published Apr 27, 2017 by L2inc.com: The best forward-looking indicator for brands? What teens are into this year? Chick-fil-A, Nike, and Snapchat. Loser: Apple, which convinced 90 million Americans to buy iPhones but can't make them use those phones to pay for products. Winner: road safety as ride-hailing apps prevent deaths from drunk driving. (1:14) L2 Analysis of Apple App Store data. 0:02 The best forward-looking indicator for brands? 0:03 What teens are into. 0:10 Their favorite restaurant? Chick-fil-A. 0:13 Taco Cabana or Cinnabon - that's a real fast food chain. 0:17 Athleisure is still in. 0:23 up from 26% last year. 0:25 And their favorite social platform? 0:35 and if you're on meth. 0:45 but it's struggling to get them to use those iPhones to pay for products. 0:53 and few ever use it again. 0:58 peaked in March of 2015. 1:00 Apple blames the poor adoption on retailers. 1:03 Let me get this. 1:04 Your PR executives went to the same graduate school as the executives at Pepsi and United. 1:09 It's your fault, retailers. 1:16 But the real reason the service hasn't taken off? 1:18 Consumers prefer credit cards. 1:23 as ride-hailing apps prevent deaths from drunk driving. 1:28 alcohol-related traffic accidents fell by 25 to 35%. 1:37 which account for a third of traffic-related deaths. 1:48 the highest proportion in the world. 1:53 than London or San Francisco. 2:02 set to my favorite DJ. 5:30 pm EDT: Amazon.com Inc. (see below). Alphabet Inc. (NASDAQ: GOOG, GOOGL) will hold its quarterly conference call (video above) to discuss first quarter 2017 financial results on Thursday, April 27, at 4:30 p.m. EDT (1:30 p.m. Pacific Time) (Eastern Time (EDT). Larry Page and Sergey Brin founded Google (principal domain: google.com) in September 1998. The company now has more than 70,000 employees worldwide, with a wide range of popular products, services, and platforms. In October 2015, Alphabet became the parent holding company of Google. Amazon.com Inc. (NASDAQ: AMZN) will hold a conference call to discuss its first quarter 2017 financial results on April 27, 2017, at 5:30 p.m. EDT (2:30 p.m. PDT). Q1 2017 Summary: Q1 EPS of $1.48 beat analysts' estimates by $0.35. Revenue $35.7B (+22.5% Y/Y) beat by $400M. UPDATE: Amazon.com (AMZN) Q1 2017 Results - Earnings Call Transcript | SeekingAlpha.com. Amazon.com Inc.EX-99.1 | sec.gov: "... True Customer Obsession - There are many ways to center a business. You can be competitor focused, you can be product focused, you can be technology focused, you can be business model focused, and there are more. But in my view, obsessive customer focus is by far the most protective of Day 1 vitality. Why? There are many advantages to a customer-centric approach, but here’s the big one: customers are always beautifully, wonderfully dissatisfied, even when they report being happy and business is great. Even when they don’t yet know it, customers want something better, and your desire to delight customers will drive you to invent on their behalf. No customer ever asked Amazon to create the Prime membership program, but it sure turns out they wanted it, and I could give you many such examples. Staying in Day 1 requires you to experiment patiently, accept failures, plant seeds, protect saplings, and double down when you see customer delight. A customer-obsessed culture best creates the conditions where all of that can happen. Resist Proxies - As companies get larger and more complex, there’s a tendency to manage to proxies. This comes in many shapes and sizes, and it’s dangerous, subtle, and very Day 2 ..."
Verisign's first quarter 2017 earnings news release will be distributed to the wire services at approximately 4:05 p.m. (EDT) April 27, 2017, and will also be available directly from the company's website at investor.verisign.com. Summary of Q1 2017: Q1 EPS of $0.96 beat estimates by $0.02. VeriSign (VRSN) Q1 2017 Results - Earnings Call Transcript | SeekingAlpha.com: "Gray W. Powell - Wells Fargo Securities LLC: Great. And then last one, if I may. Just any update on the .web antitrust investigation? D. James Bidzos - VeriSign, Inc.: No substantive update. We continue to cooperate with the Department of Justice relative to the CID that we discussed last quarter. Those interactions and dialogues have been constructive. We're producing documents and information and answering their questions as needed. So it's an ongoing process. Nothing substantive to update now. But, of course, as soon as there is, we'll share it with you." LIVE Webcast and teleconference info: Verisign will host a live teleconference call on April 27, 2017, at 4:30 p.m. (EDT), which will be accessible by direct dial at (888) 676-VRSN (U.S.) or (913) 312-1504 (international), conference ID: Verisign. A listen-only live webcast of the earnings conference call will also be available at https://investor.verisign.com. An audio archive of the call will be available at investor.verisign.com/events.cfm. Verisign is a domain names registry operator and internet security services provider. Verisign ensures the security, stability and resiliency of key internet infrastructure and services, and two of the internet's 13 root servers, and performs the root zone maintainer function for the core of the internet's Domain Name System (DNS) pursuant to an agreement with ICANN. Verisign's Security Services include intelligence-driven Distributed Denial of Service Protection and Managed DNS. Verisign is the exclusive (monopoly) registry operator of the .COM and .NET TLDs (top-level domains), for which it collects annual registration fees for each of the 143+ million .com and .net registered domain names. "Margin on this recurring revenue is extraordinarily high and minimal need for cash in the business. 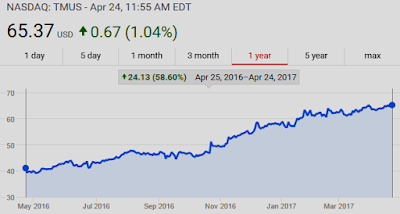 Bought back stock aggressively in the last ten years (diluted shares shrunk from around 250 million to 125 million)"--Verisign | investoralmanac.com. Warren Buffett's Berkshire Hathaway is the second-largest institutional owner of Verisign shares. 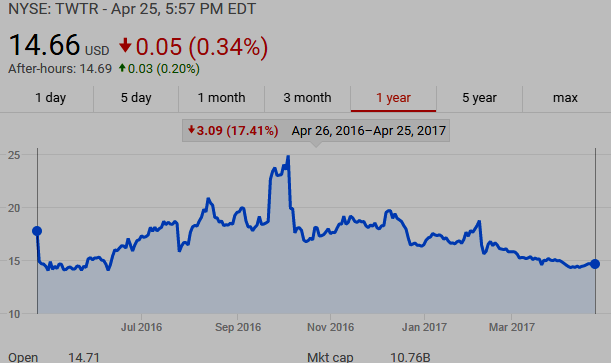 See also: VeriSign Stock Repurchase Capacity | SeekingAlpha.com: "... The company's stock buybacks should retire 25-28% of the shares outstanding in the next 5 years.With the buybacks and slow growth, investors should be rewarded generously over the next few years compared to the overall market ..."
Twitter beat Q1 2017 estimates with $548M revenue and 328M MAUs, up 9M Q/Q and 7M more than expected, DAUs up 14% YoY--UPDATE: Twitter (TWTR) Q1 2017 Results - Earnings Call Transcript | SeekingAlpha.com. Apr 24, 2017: Watch the LIVE REPLAY of @JohnLegere and the @TMobile senior leadership team as they deliver Q1 2017 results. T-Mobile $TMUS Q1 2017 Financial Results, LIVE Webcast April 24, 4:30pm EDT--special Domain Mondo coverage due to T-Mobile recent acquisition of wireless spectrum (see on Domain Mondo: Tech Review | Disruption: T-Mobile Big Winner of FCC's Spectrum Auction). T-Mobile US, Inc. (NASDAQ:TMUS) (domain: t-mobile.com) will discuss its first quarter 2017 financial and operational results as well as the results of the recent 600 MHz FCC spectrum auction on Monday, April 24, 2017 at 4:30 p.m. EDT--Q1 2017 Earnings Call LIVE Webcast. T-Mobile US - Q1 2017 results: Q1 EPS of $0.80, Revenue $9.62B (+11.9% Y/Y). 1.1 Million Customer Net Additions, Record-Low Churn of 1.18%. The @TMobileIR Twitter account (embed below) will live-tweet the earnings call. Participants have multiple ways to submit questions including via phone, Twitter (tweet using $TMUS) and Facebook (www.facebook.com/JohnJLegere via post comment). T-Mobile will also take questions via text and respond to some of them on the call (send a text message to 313131, enter the keyword TMUS followed by a space). Similar to past quarters, prepared remarks will be kept to a minimum in order to provide more time for free-flowing dialogue with analysts, investors, media and consumers. Replay of the earnings call will be available for two weeks starting shortly after the call concludes and can be accessed by dialing 888-203-1112 (toll free) or 719-457-0820 (international). The passcode required to listen to the replay is 4867010. The Q1 2017 earnings release and call will also be available via the Company's Investor Relations website: http://investor.t-mobile.com/. T-Mobile US, Inc. will issue a press release and Investor Factbook reporting its results at approximately 4:05 p.m. EDT on Monday, April 24, 2017. The press release and Investor Factbook will be posted at the same time on the Investor Relations website. T-Mobile Social Media: Investors and others should note that the Company announces material financial and operational information to its investors using its investor relations website, press releases, SEC filings and public conference calls and webcasts. The Company also intends to use the @TMobileIR Twitter account (https://twitter.com/TMobileIR) and the @JohnLegere Twitter (https://twitter.com/JohnLegere), Facebook and Periscope accounts, which Mr. Legere also uses as means for personal communications and observations, as means of disclosing information about the Company and its services and for complying with its disclosure obligations under Regulation FD. The information we post through these social media channels may be deemed material. Accordingly, investors should monitor these social media channels in addition to following the Company’s press releases, SEC filings and public conference calls and webcasts. The social media channels that the Company intends to use as a means of disclosing the information described above may be updated from time to time as listed on the Company’s investor relations website. Note also that on Tuesday, April 25, 2017, at 4:30 p.m. EDT, AT&T (NYSE: T) will host a conference call to discuss its Q1 2017 results. The company’s earnings release, Investor Briefing and related materials will be available at AT&T Investor Relations. A live webcast of the call will also be available at AT&T Investor Relations, and the webcast replay will be available until June 30, 2017. 1) Convergex's Colas Says Public Equity Market May Be a Broken Concept: Nick Colas, chief market strategist at Convergex [domain: convergex.com], says David Einhorn's General Motors plan exposes broken public equity markets. 2) Dawn Sandoval, COO at Kalyx Development [domain: kalyxdevelopment.com], discusses the current outlook for the cannabis real estate market and the impact of Attorney General Jeff Sessions' anti-drug stance. 3) Stephen Jones, CEO at Covanta [domain: covanta.com], talks about the waste-to-energy process. 4) Finally, Bloomberg's Laura Keller discusses her article, "Wall Street's WhatsApp Secret: Illegal Texting Is Out of Control." See also: Wall Street's WhatsApp Secret: Illegal Texting Is Out of Control | Hacker News | news.ycombinator.com. Trader to me just now: "Great article, ppl talking about it. ... Probably shouldn't be texting, lol"
Features • 1) The Global Splinternet, 2) ICANN news: .NET Registry Agreement and Domain Transfers & Changes, 3) Names, Domains & Trademarks: WIPO IP Day, 4) ICYMI Internet Domain News, 5) Q1 2017 Earnings This Coming Week: TWTR, GOOG, AMZN, VRSN, 6) Most Popular. 1) The Global Splinternet: Digital Borders, TLD Filters & Tolls? Now it's the Left that's descending into fascism | charleshughsmith.blogspot.com: "... the Left must mask its own corruption and role in the Corporatocracy structure. The Left accomplishes this by imposing a virtue-signaling conformity on corporate media, social media, and the state institutions under its control-- higher education, government agencies, etc. Dissent is by definition fake news or hate speech--Orwell would be so proud of the Left's deft doublespeak. The suppression of skeptical inquiry and alternative narratives is fascism. 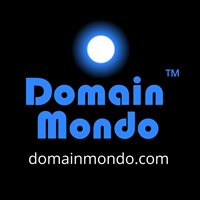 There is no way to sugar-coat this ..."
For more background on the above: GNSO Admits Domain Name Transfer Policy Flawed, Blames ICANN Staff | DomainMondo.com. Revised ICANN Procedure For Handling WHOIS Conflicts with Privacy Law | ICANN.org: Effective Date 18 April 2017 - View the Redline Version of the Revised Whois Procedure (pdf). What's in a Name? For a Business . . . Oh, Everything | entrepreneur.com: "Be careful with geographic names"
President Trump's nominee to lead the U.S. Department of Justice's Antitrust Division, Makan Delrahim, will appear before the Senate Judiciary Committee on Wednesday. China says Cyberspace governance leads to more freedom | China.org.cn: "... Most countries applauded President Xi's proposal for building a community of shared future in cyberspace. "The proposal features the greatest common divisor. It is inclusive enough so that no one stands out to oppose it," said Prof. Shen Yi, director of the Research Center of Cyberspace Governance at Fudan University in Shanghai, adding that many countries hoped that "community of shared future" be more tangible and practical ..." See also CAICT Holds ICANN 58 China Internet Community Readout Session | circleid.com. Mossberg: A plan to preserve the internet | TheVerge.com: "It should be protected for all, not sold off in pieces." Scams & Malware: A study (pdf) conducted by PhD candidates at Stony Brook University identifies malvertising as a major culprit for exposing users to technical support scams. Ransomware: Banks’ Boards of Directors Face New Cybersecurity Challenges | BakerHostetler | JDSupra.com: "ransomware attacks against businesses in the U.S. quadrupled in 2016 ... intensity of distributed denial of service (DDoS) attacks has also increased"